Today's card was so much fun to make! 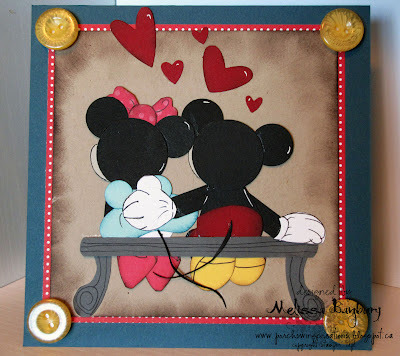 It's my sister and brother-in-laws 2nd anniversary today and I thought what better way to depict a little love than with none other than Mickey and Minnie Mouse! I seem to be stuck on punch art as of late; I just really love the challenge of making something out of circles, ovals, and squares. I'm sure like everything else I'll need a shake me up soon and move on to something else to create a one of a kind card :) Until then folks, your stuck with me and my punches LOL. Thanks so much for looking; it's much appreciated!! This is fabulous! and I love the detailing with the white dots on the border. Looking at the line up of punches, I'd say great job on shaping into this great scene! Ur cards are just adorable. Just found your site via Pinterest. This will definitely be on my favorites! Thanks so much for sharing. I'm going to be here for hours! LOL.